Today is the last day of 2013....where did this year go? Looking back on the year and recounting all the amazing moments I feel truly blessed. This year was filled with "pinch me" moments and of course a few pitfalls that caused me to grow and give me a new perspective on life. 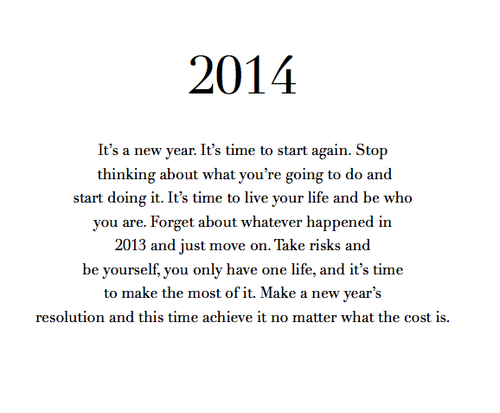 Honestly after this life changing year I can't wait to discover what 2014 has in store. I'm excited to continue crossing things off my 101 in 1001 list and see what surprises pop up along the way. I also want to thank those of you who read this blog every day, and friends who continually support and encourage me. I started this blog as a little creative outlet when I moved to Chicago and now I can't imagine life without it. I'm so grateful for the opportunities and friends I've met this year, and I hope you'll stick around for some exciting posts in 2014. Cheers! It's been fun getting to know you via the blog in 2013, and best wishes to you in the New Year! Loved seeing the items you crossed off your list - checking off some more is bound to make for a great 2014 too.